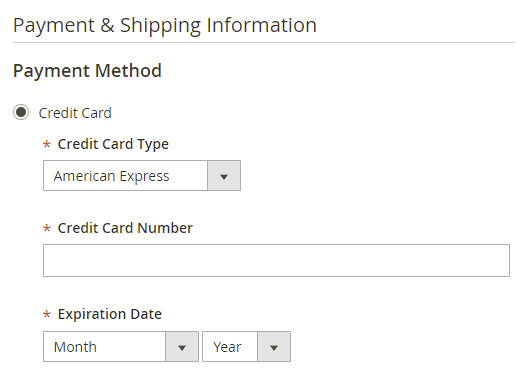 Saved Credit Card functionality for Magento 2 is back! Do you need to process credit cards offline or using your card terminal manually? 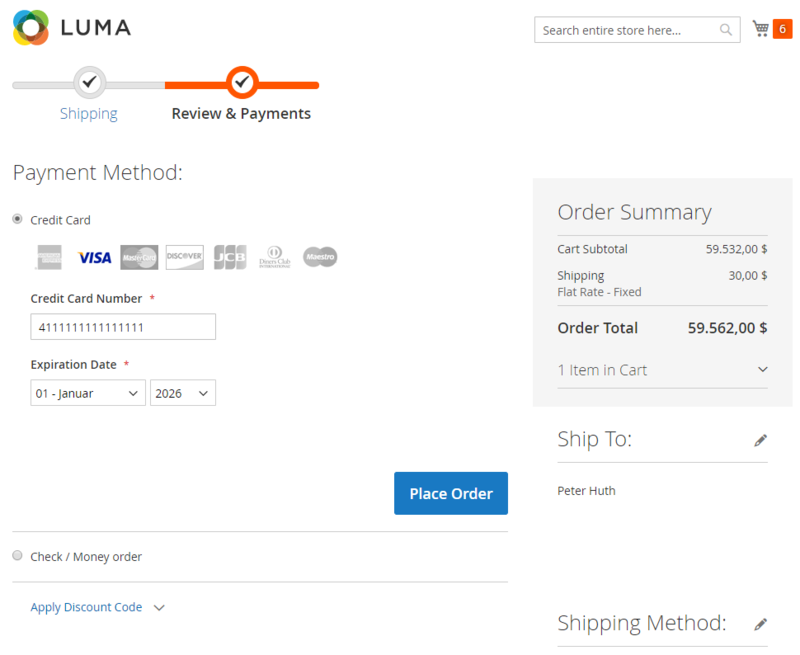 Need to save credit card numbers for orders placed by your customers? 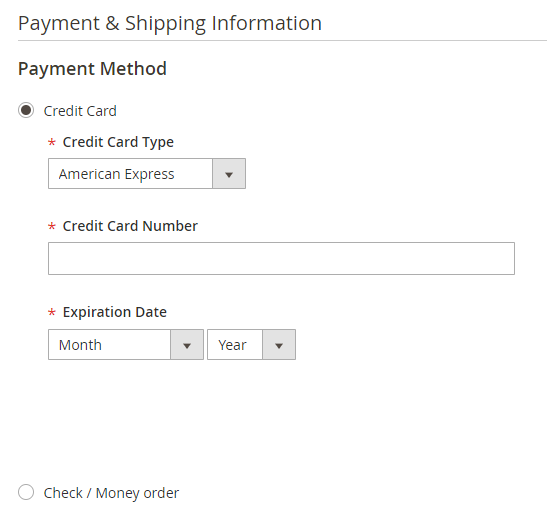 Then this is the extension you've been looking for - this is a payment method for Magento that saves credit card information entered in the checkout by your customers encrypted in the Magento database. 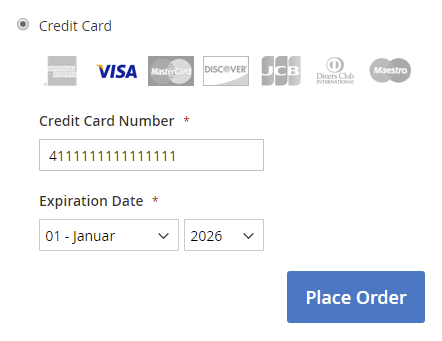 This extension allows you to set up a new payment method in the Magento 2 checkout that looks like any other credit card payment method - the customer has to enter their credit card number as well as the expiry date. This information is then stored in the Magento database, encrypted using Magentos built-in encryption mechanism. 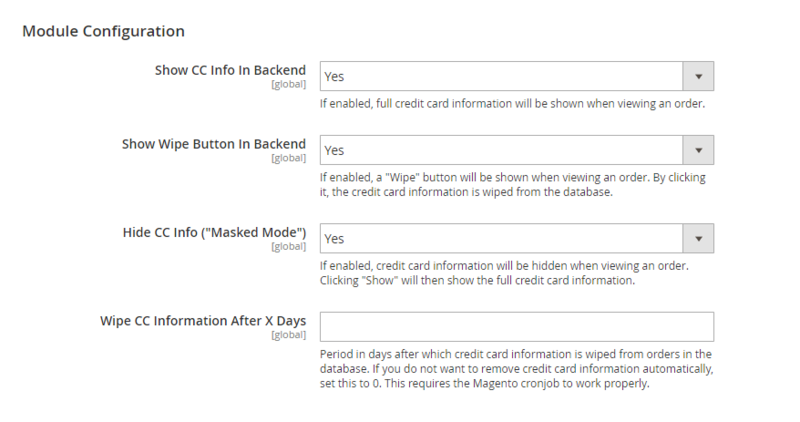 The full credit card information can then be seen by authorized admins in the Magento administration panel. 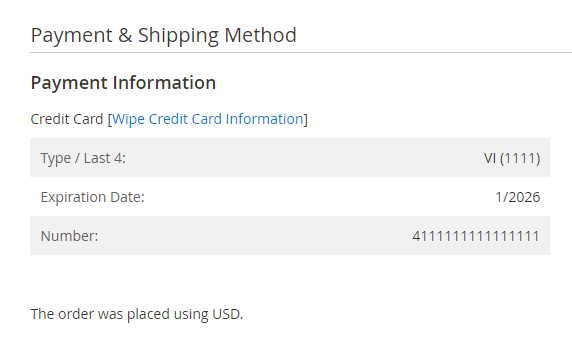 This extension is similar to the "Credit Card (Saved)" payment method that existed in Magento 1 (known as "ccsave"), but which doesn't exist in Magento 2 anymore. Further module configuration, enabling/disable wiping, etc. Store credit card type, number and expiration date for processing the credit card later on. 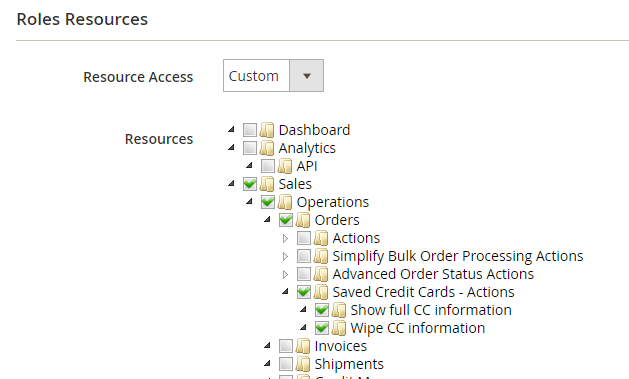 Credit card information is stored encrypted in the Magento database. 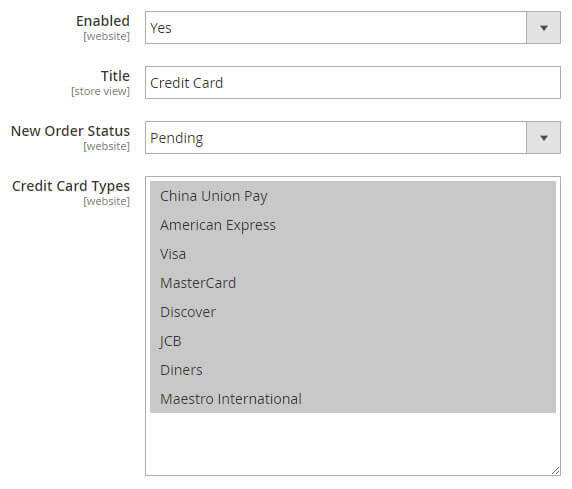 Display extended credit card information in the backend, export it or retrieve it via the API. Ability to hide ("mask") credit card information in backend and reveal it by pressing "Show"
The Saved Credit Cards extension will behave like any other payment method. 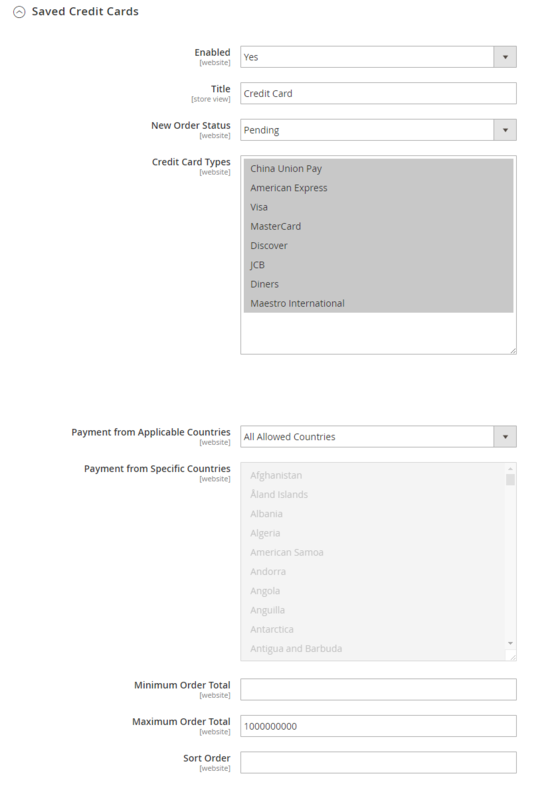 Set up allowed countries, order status, sort order, etc. Take orders online or via telephone and process credit cards offline. 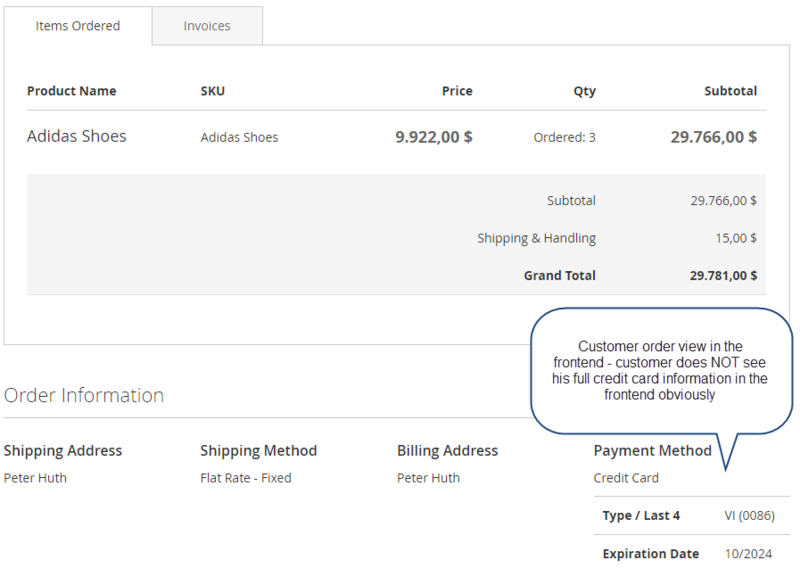 Credit card information is validated offline using Magento built-in CC validation. Includes the ability to wipe credit card information from within the order after processing it. Also, includes a feature to automatically wipe credit card information from orders older than X days. Please note this is an offline payment method. This means, entered credit cards will not be validated, authorized, or charged. The credit card information is only stored in the database for further processing by your applications and/or humans that manually copy/paste stored credit card information and process it. This method is useful when you have a card terminal in a “brick and mortar” store, or have access to a virtual terminal. As with all online payment methods, it is highly recommended that you configure an SSL certificate for your store. Attention - read this before purchasing the extension: In most countries, storing full credit card information on your server is not permitted unless you are fully PCI certified. It is against PCI standards to keep customer credit card information in your database. Use this extension at your own risk, and be sure to check whether you are allowed to store credit card information yourself or not. This extension was built for environments where storing credit card information is allowed, and we will not take any liability for stores using this extension in production environments where storing credit card information locally is prohibited. Also, storing the CVV/CVC (3/4 digit security code) is not possible out of the box, however, if you are confident you are allowed to store it, please send us an email and we can provide instructions to add support for this (at your own risk). * Whenever CC wiping cronjob runs, last 5 days are wiped as well so in case cron fails, no orders are missed.